Where does all your waste that is collected by EC Waste services go to? We make it a priority to recycle all that can be, the rest all go to the landfill sites, which can contribute to the environmental problems. 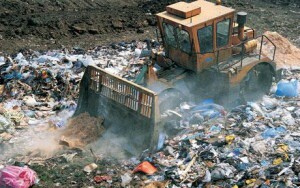 Using the landfill sites can create environmental issues which can affect water, soil and vermin infestation. When disposing organic materials in landfill, they emit methane which is a greenhouse gas that is more potent than carbon dioxide. Waste collection vehicles are weighed at the weighbridge once they arrive at the landfill. After they unload all the waste onto the landfill, a compactor or bulldozer will then spread and compact the waste and cover the waste with soil, wood chippings or other materials. The waste collection vehicles usually pass through a cleaning facility before leaving and if needed, it goes back through the weighbridge to calculate the waste deposited. Using incineration over landfill has its benefit as it reduces the waste volume and they are equipped to prevent pollutants in the gas from entering the atmosphere. Incineration involves the combustion of any organic materials in the waste, it is converted into ash, gas and heat. The heat is used to boil water, which powers steam in to the generators that then produce electricity and heat to be used in your homes and businesses. There is also in-vessel composting that covers a wide range of composting systems, which all involve the enclosed composting of waste that allows oxygen levels, temperature and moisture to be controlled. It can be a one or two stage process; food and garden waste is shredded to a uniform size and loaded into a bay or tunnel. Any natural occurring micro-organism that is present starts to break down. The process draws out oxygen from the air and raises the temperature to the 60-70 degrees Celsius which kills weed seeds and pathogens. Compost is produced with water vapour and carbon dioxide is given off as by-products. If needed the material is transferred to a second barrier to ensure the material is fully sanitised.